Consider these two places: Walking into Green Acres, you immediately sense that you have entered an oasis-traffic noise left behind, negative urban distractions out of sight, children playing and running on the grass, adults puttering on plant-filled balconies. Signs of life and care for the environment abound. Innumerable social and physical clues communicate to visitors and residents alike a sense of home and neighborhood. This is a place that people are proud of, a place that children will remember in later years with nostalgia and affection, a place that just feels "good." Contrast this with Southside Village. Something does not feel quite right. It is hard to find your way about, to discern which are the fronts and which are the backs of the houses, to determine what is "inside" and what is "outside." Strangers cut across what might be a communal backyard. There are no signs of personalization around doors or on balconies. Few children are around; those who are outside ride their bikes in circles in the parking lot There are few signs of caring; litter, graffiti, and broken light fixtures indicate the opposite. There is no sense of place; it is somewhere to move away from, not somewhere to remember with pride. These are not real locations, but we have all seen places like them. The purpose of this book is to assist in the creation of more places like Green Acres and to aid in the rehabilitation of the many Southside Villages that scar our cities. 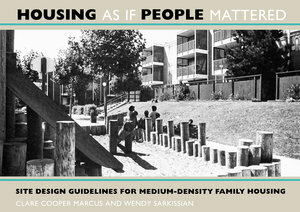 This book is a collection of guidelines for the site design of low-rise, high-density family housing. It is intended as a reference tool, primarily for housing designers and planners, but also for developers, housing authorities, citizens' groups, and tenants' organizations-anyone involved in planning or rehabilitating housing. 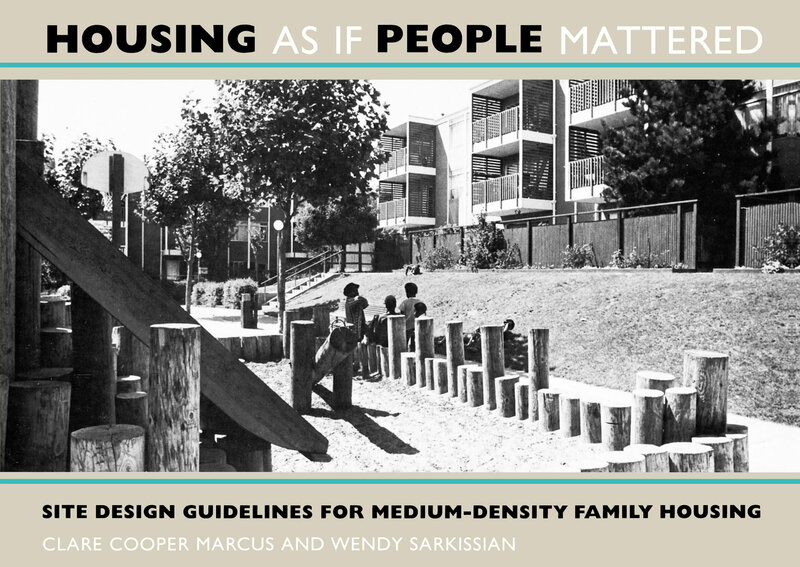 It provides guidelines for the layout of buildings, open spaces, community facilities, play areas, walkways, and the myriad components that make up a housing site. Clare Cooper Marcus is Professor Emeritus in the Departments of Architecture and Landscape Architecture at the University of California, Berkeley, Clare Cooper Marcus is internationally recognized for her pioneering research on the psychological and sociological aspects of architecture, land-use planning, and landscape design – particularly urban open space. Wendy Sarkissian bring planning to life with over 40 years’ experience in planning, design and environmental studies. Educated in Arts, literature, town planning and environmental ethics, I am a planner, author, educator, facilitator and consultant, working primarily in planning and development in Australia and overseas.